You've found the “U.S. Boer Goat Breeders” page here at Hobby Farm Wisdom! If this is the first time you have visited our site: Welcome! The Boer goat is a breed of domestic goats that were developed for meat production in South Africa in early 1900. The origin is not completely known but is assumed to be a cross between the indigenous goats of the Namaqua Bushmen and Fooku tribes. 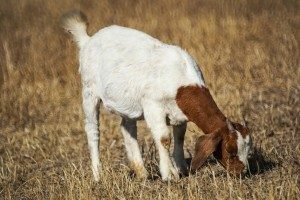 Since Boer goats have been bred primarily for meat production, they possess a quick growth rate and excellent carcass qualities. They are currently one of the most popular goat breeds in the world for meat. Boer goats usually have completely white bodies with uniquely brown heads. Like other goat breeds, they have long, drooping ears. Boers are known for their docile temperaments, high fertility rates and excellent mothering qualities.